Mens I'm Not A Business Man. I'm A Business, Man. 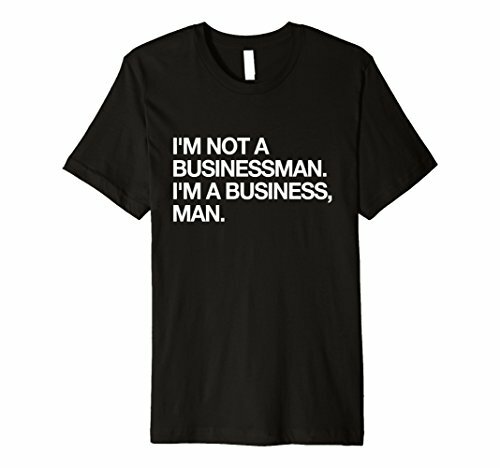 T Shirt Medium Black by I'm Not A Business Man. I'm A Business, Man. at Helix Alumni. Hurry! Limited time offer. Offer valid only while supplies last. Brand: I'm Not A Business Man. I'm A Business, Man. Are you more than just an ordinary business person? You ARE the business! Wear it proudly with this premium T-Shirt. Fitted Tee, Premium Material to last after many washes. This fire doesn't extinguish! Manufacturer: I'm Not A Business Man. I'm A Business, Man. Publisher: I'm Not A Business Man. I'm A Business, Man. Studio: I'm Not A Business Man. I'm A Business, Man. If you have any questions about this product by I'm Not A Business Man. I'm A Business, Man., contact us by completing and submitting the form below. If you are looking for a specif part number, please include it with your message.